Jason Bridges as Edgar Allan Poe. Photo Credit: Cory Weaver. If you are up to your neck in Christmas puffery (not that I don’t love “A Christmas Carol” or “The Nutcracker”), a dose of Poe may be just what the doctor ordered. 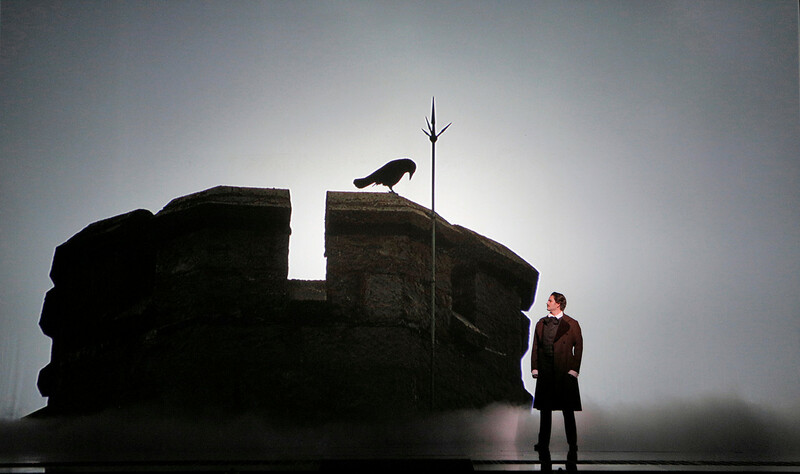 The San Francisco Opera, in collaboration with the Welsh National Opera, presents an amazing double feature of the American premieres of two different adaptations of Poe’s haunting and horrifying “The Fall of the House of Usher.” One is in English by contemporary composer (and San Francisco citizen and philanthropist), Gordon Getty. The second is an unfinished work by Claude Debussy, reconstructed and orchestrated by Robert Orledge. Let’s start with the simple observation that this is not traditional opera. The melodic content in both pieces is often atonal. To listeners accustomed to traditional, pre 20th-century, opera, the impression created might seem like endless recitative with no arias to speak of and an absence of memorable melodies. A lovely ballad in Getty’s version, “”Where Is My Lady and Where is She Gone,” is a startling exception, beautifully performed by tenor, Jason Bridges, in the role of Edgar Allan Poe. Wait a minute? Poe is a character in this opera? Well, yes he is, in Getty’s version (not Debussy’s). Both librettos take, shall we say, great liberties with the story as Poe wrote it. This is inevitable. Poe’s masterpiece is large on mood and short on exposition. For theatrical purposes, a great deal of story has been added in both versions. Musically, both operas are clearly of the the 20th century, although Getty’s version (which premiered in 2014) looks back to the music of the 19th century, whereas Debussy’s (originally composed around 1915 and reconstructed and orchestrated by Robert Orledge) looks forward to 20th century developments. In both operas, audiences will be thrilled, in particular, by the complex and independent orchestrations, which support, challenge, interact with, and comment upon the vocal lines without mirroring or duplication. Those vocal lines, again, in both operas, are striking for their conversational qualities. They do not repeat, much, but seem to be through composed (without repetition but continually developed) for the entire length of the operas. The demand on the singer/actors is enormous and every member of both casts is impressively successful in rising to the occasion. Jamielynn Duggan as Madeline Usher and Anthony Reed as Dr. Primus. Photo Credit: Cory Weaver. In particular, Adler Fellow Anthony Reed as Dr. Primus in Getty’s version is a triple-threat stand out as singer, actor and dancing partner for Jamielynn Duggan who gives an impressive, extraordinarily haunting dance performance as Madeline Usher (choreographed by Jo Jeffries). Brian Mulligan sings the role of Roderick Usher in both operas with suppleness and grace, which can also be said of Jacqueline Piccolino’s singing of Madeline Usher. Conductor Lawrence Foster made his San Francisco Opera debut earlier this season with Mozart’s “The Magic Flute.” With the present production, he demonstrates an astonishing versatility, conducting in a completely different style. His handling of the orchestra is subtle, masterful, and thrilling, and seemingly effortlessly sustains interest throughout the entire performance. Tenor Joel Sorenson is more than fine as Le Médecin in Debussy’s version of the story, as is Adler Fellow Edward Nelson (who gave a standout performance as Fiorello in “The Barber of Seville”) in the role of L’ami de Roderick. In addition to the musical excellence and originality of this production, it includes a remarkable production design by Niki Turner, featuring astonishing video by David Hanneke that perfectly captures a visual representation of Roderick Usher’s disturbed mind. Hanneke’s images may have the power to haunt your dreams for years to come. The double bill of Getty’s and Debussy’s versions of “The Fall of the House of Usher” plays through December 13 at the War Memorial Opera House. For further information, click here. 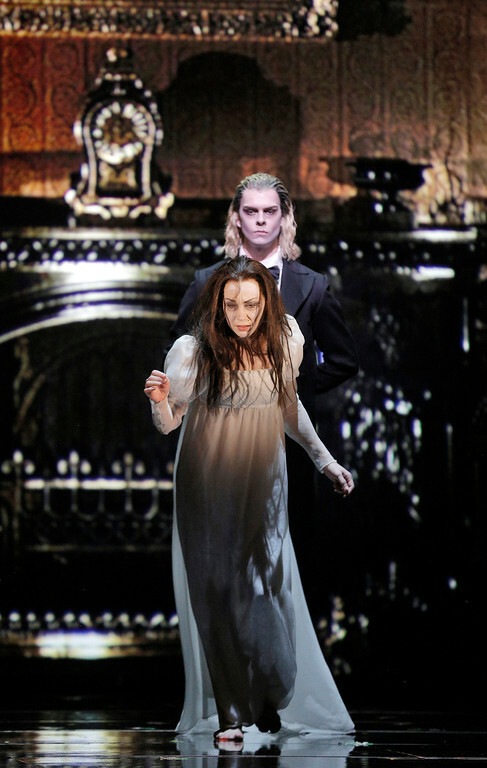 “The Fall of The House of Usher,” music and libretto by Gordon Getty, after Edgar Allan Poe. Edgar Allen Poe: Jason Bridges. Roderick Usher: Brian Mulligan. Madeline Usher (dancer): Jamielyn Duggan. Doctor Primus: Anthony Reed. Madeline Usher (voice): Jacqueline Piccolino. “The Fall of The House of Usher,” music and libretto by Claude Debussy after Edgar Allan Poe. Reconstruction and Orchestration by Robert Orledge (Sung in French with English supertitles). Lady Madeline: Jacqueline Piccolino. Le Médecin: Joel Sorenson. Roderick Usher: Brian Mulligan. L’Ami: Edward Nelson. Conductor: Lawrence Foster. Director: David Pountney. Production Designer: Niki Turner. Video Production Designer: David Haneke. Lighting Designer: Tim Mitchell. Lighting Supervisor: Benjamin Naylor. Choreographer: Jo Jeffries. Dance Master: Lawrence Pech. Posted in Reviews.Tagged Anthony Reed, Brian Mulligan, Charles Kruger, Claude Debussy, David Haneke, David Pountney, Edgar Allan Poe, Edward Nelson, Gorden Getty, Jacqueline Piccolino, Jamielynn Duggan, Jason Bridges, Jo Jeffries, Joel Sorenson, Lawrence Foster, Niki Turner, Robert Orledge, San Francisco Opera, San Francisco Theatre Reviews, The Fall of the House of Usher, theatrestorm.